We speak with Lebanese contemporary artist Ali Cha'aban whose work often speaks of the cultural dichotomy faced by Arabs across the region. 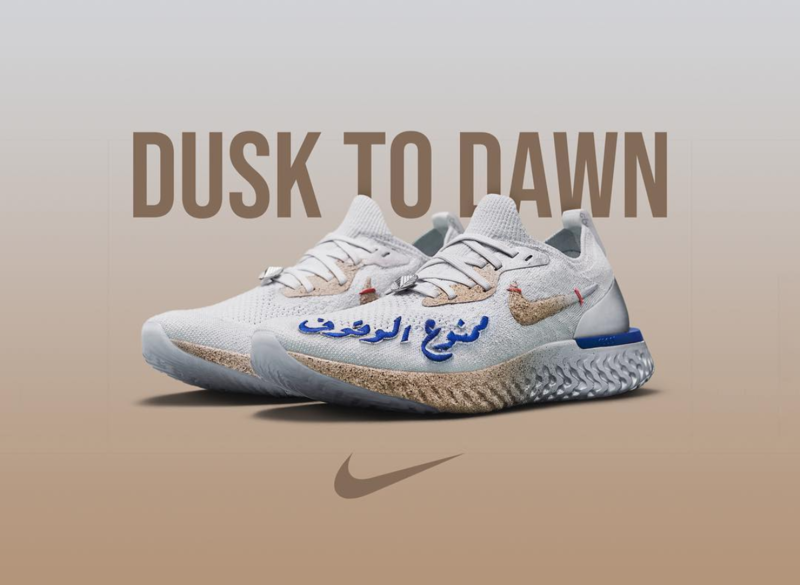 When the image of a stunning pair of Nike running shoes, emblazoned with an Arabic slogan, popped up on the social media accounts followed by street and sportwear addicts across the world, those in the know didn't take long to realise that the sneakers must have something to do with Ali Cha'aban. The Lebanese artist has been on the radar of contemporary art and pop culture aficionados alike for a few years now, espousing a point of view that's both increasingly relevant and progressively poignant - despite nostalgia often taking centre stage - whether his medium du jour is photography, graffiti, sneaker design, or even rugs. "As a contemporary artist, I consider myself from the school of Marcel Duchamp, [creating] an art that serves the mind. Once we depart from the ideals that art should be aesthetically pleasing, we find ourselves in a place where the idea, concept or message is more important than the execution," the 28-year-old says as we catch up in the wake of the sneakerhead social media hysteria that the Nike release created. With only 30 pairs of the special edition Epic React Flyknit shoes made, the shoes were quickly hailed as more exclusive (and thus, more coveted) than Kanye West and Adidas' Yeezy's, Rihanna's Puma collaboration and even the Holy Grail of collectable kicks - Air Jordans. "The concept of the shoe is inspired by the streets of Hamra, Lebanon; tight alleyways with barely space for any cars and No Parking signs everywhere, which is embroidered on the shoes," says Cha'aban. In Arabic it has a double meaning, the second being “Don’t Stop,” aligning with the React [line of shoes], meant to never slow down. "The colour way is associated with the texture of concrete, with the silver depicting industrial and high-tech. Combining the two into a gradient highlights a contrast and a synergy at the same time." I often combine Western and Arabic cultural motifs, [as] a signifier, a reflection of modern Arab societies caught between the seductive power of the global pop culture and the traditional cultural sphere dominated by mysticism. Synergy and contrast are often found in Cha'aban's work. 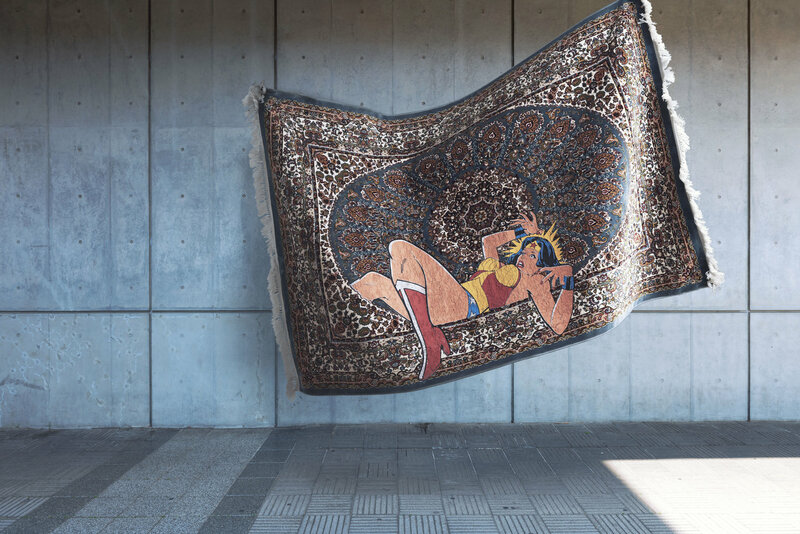 The Broken Dream is a perfect example of that - a two part series of superhero images (Superman and Wonder Woman), silkscreened on traditional Persian rugs speak of the cultural dichotomy faced by Arab millennials across the region. So too does 'What's halal my killer? What's haram my dealer?' 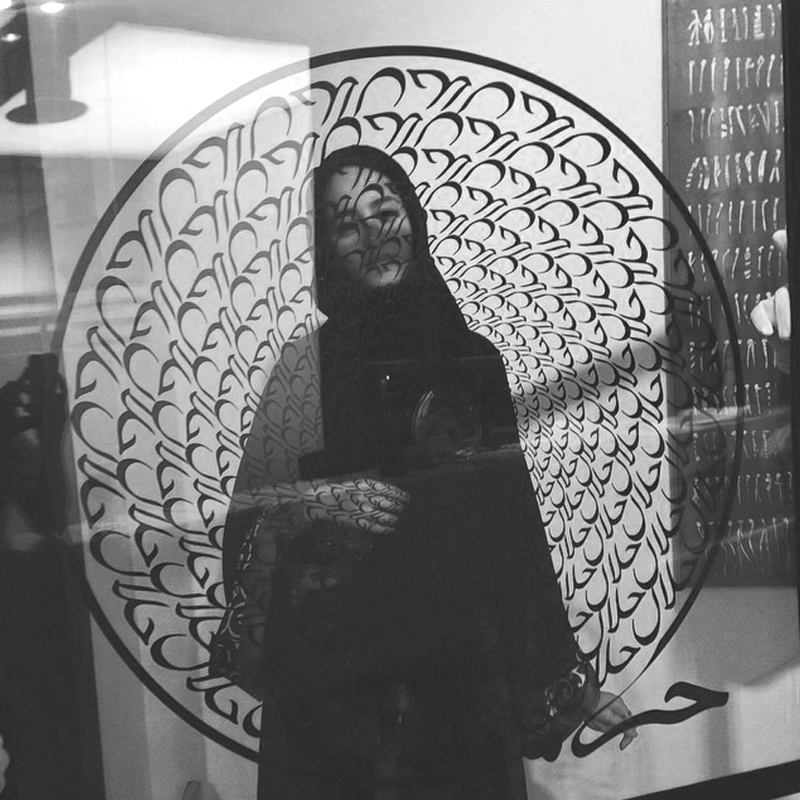 - a digital print encased in plexiglass showing a spiral of Arabic typography spelling out the word halal over and over, wrapped up by the word haram. 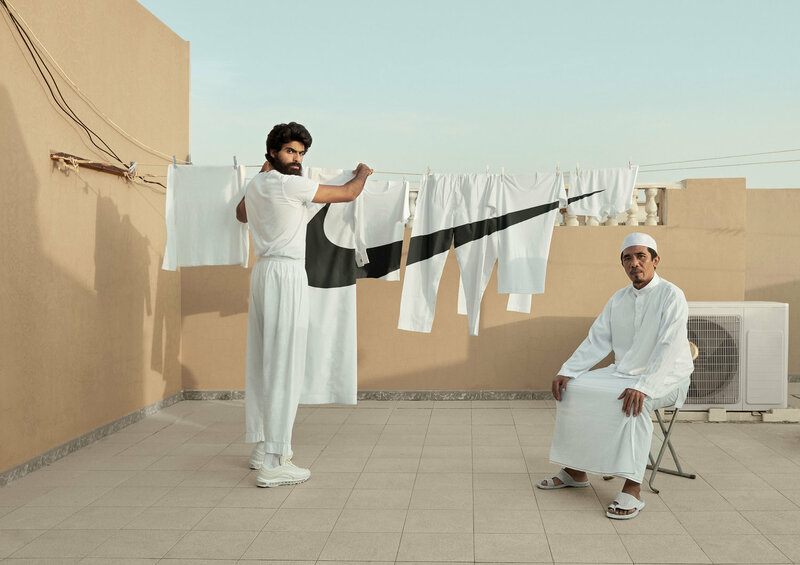 Before the Nike sneaker, the artist teamed up with fellow art director Rayan Nawawi to produce a stunning shoot for the sportswear giant and Vice magazine, showcasing men clad in typical thobes and pristine Nike Air Max 97s atop rooftops cluttered with satellite dishes, hanging laundry and air conditioning units - an image recognisable across the Middle East. 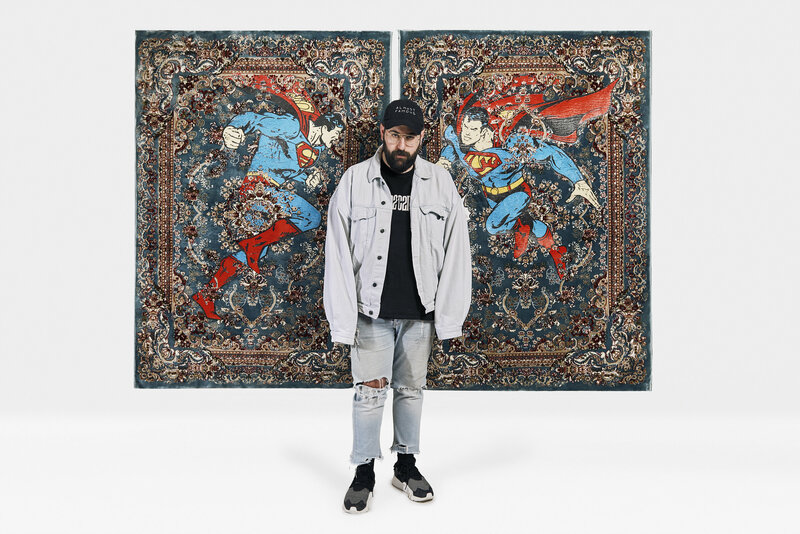 "I often combine Western and Arabic cultural motifs, [as] a signifier, a reflection of modern Arab societies caught between the seductive power of the global pop culture and the traditional cultural sphere dominated by mysticism," Cha'aban explains. The clash of cultures often present in Cha'aban's work is underlined by his own point of view that 'Arabs are strangers everywhere' - a motto of sorts that became a springboard for his art career. 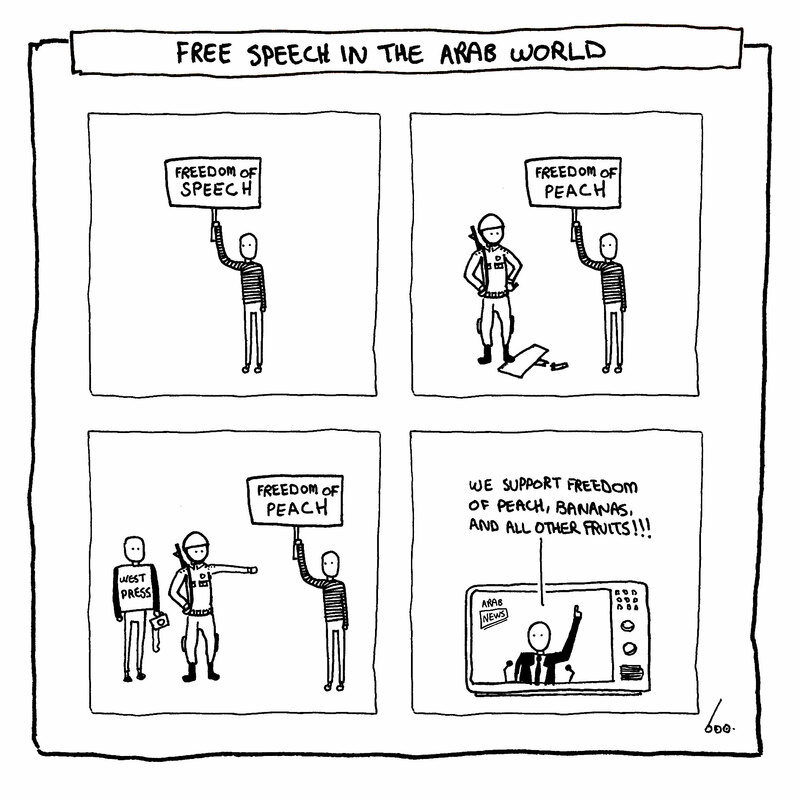 "That emotion started within me around the start of the Arab Spring. Seeing all these insurgencies and civil wars occur made me feel nostalgic towards a peace that never materialised... I didn’t always want to become an artist, I was motivated by the need to comment on social and political events via visual representations," he says. While many contemporary artists, especially those who integrate pop culture themes, tend to produce globalized work that can resonate equally with viewers from New Dehli to New York, Cha'aban's portfolio, spanning about a decade now, is distinctly regional in its content and intention. "The Arabian peninsula as a whole is very inspiring, its richness in culture and diversity makes it a melting pot. The identity on its own is a content generator, so much to consume in one take. It inspires because of the infusion of past and present; heritage and modernity, all presented on a silver platter," he says. I fear the cultural appropriation we are facing. 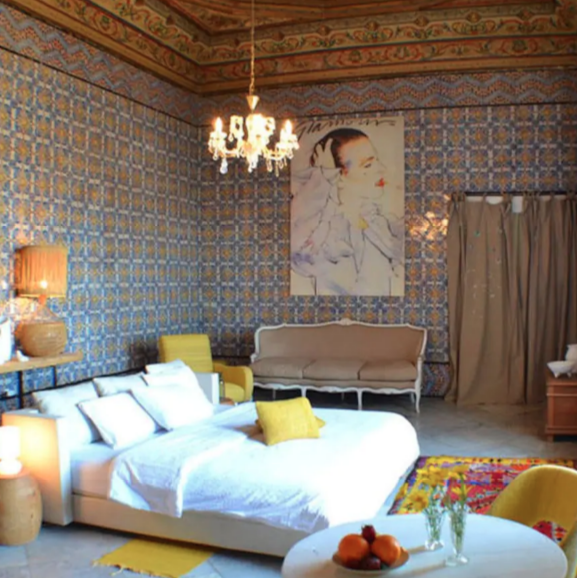 Many see the Arabic aesthetic as a means of commercialism. Seeing the West imitate some of our traditions is tragic, and I feel that belittles our culture into a 'trend' rather than a milestone. While his uniquely Middle Eastern inspiration and message does not mean that Cha'aban's audience is or will be exclusively Arab - "I think the Arab aesthetic is gradually becoming more prominent. 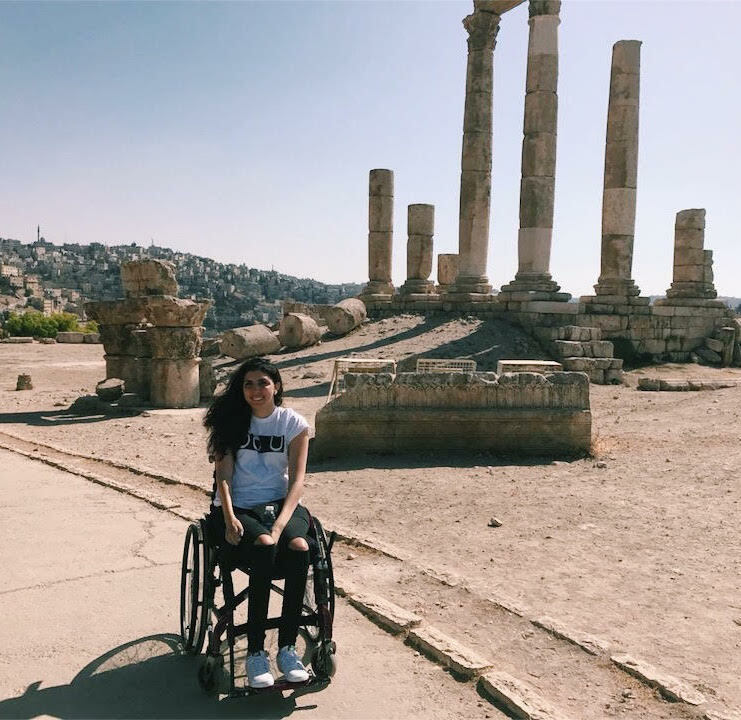 Thanks to the fast pace of the Internet, the world is slowly starting to view us more as creators," - the artist is somewhat wary of the increasing visibility of Arab art, in all its forms, on the global stage. "I fear the cultural appropriation we are facing. Many see the Arabic aesthetic as a means of commercialism. Seeing the West imitate some of our traditions is tragic, and I feel that belittles our culture into a 'trend' rather than a milestone." And it's perhaps this fear, this feeling of being in between two worlds, never quite comfortable in either, that contributes most to Cha'aban's underlying ethos. "My work can be simplified by ‘Hiraeth’, which is a Welsh word that means nostalgia; a homesickness for a home to which you cannot return or a home which maybe never was," explains Cha'aban, realising that this concept - especially for modern, young Arabs like himself - can be oxymoronic. "Many have referred to my work as dystopian and contrary to idealistic daydreams. [But] maybe I long for a state of identity that lives between the different people, factions and ideologies [in the Middle East] that will never be grasped. 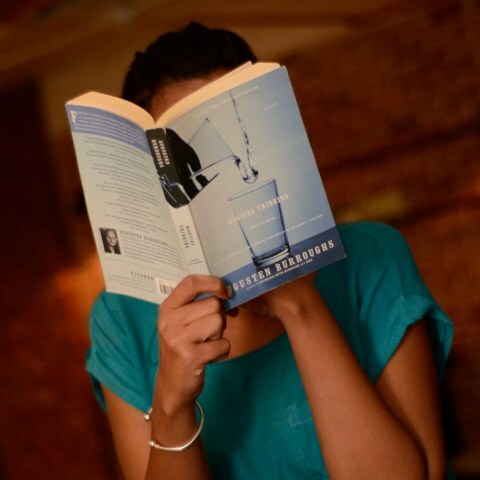 And that makes me idealistic, meaning I’m a walking paradox." 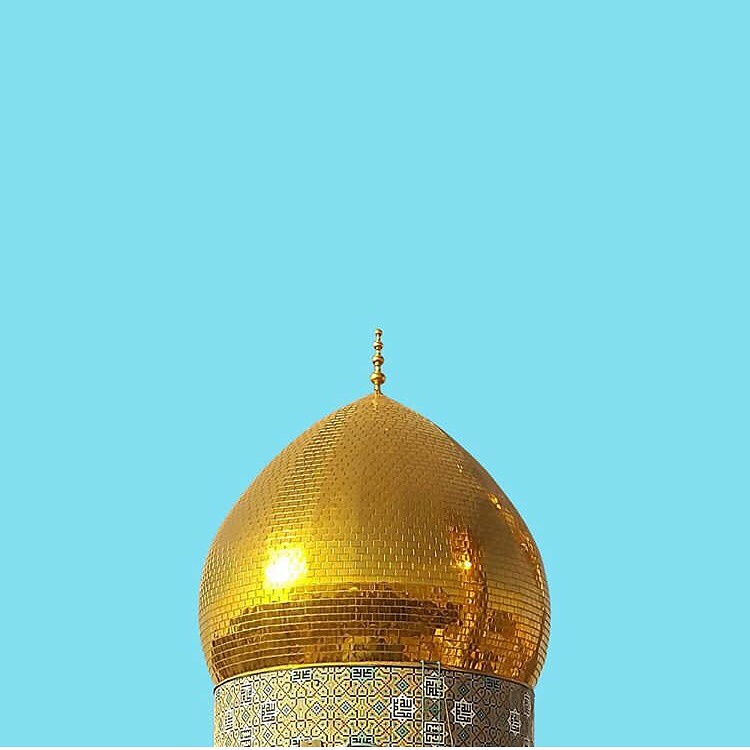 For more of Ali Cha'aban's work, check out his Instagram @AliChaaban.